The best-known chimera – guardian demon – is le Stryge. 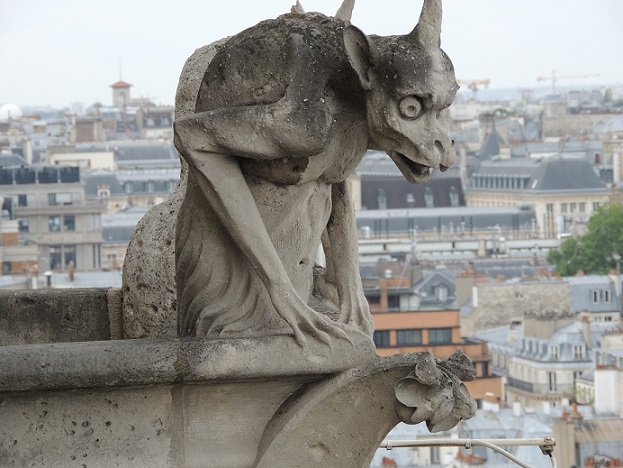 Parishioners in the late-1800s rushed to Mass, averting their eyes from the eerie, frightening creatures that protruded from the Notre Dame Cathedral in Paris. The creatures had a practical purpose. 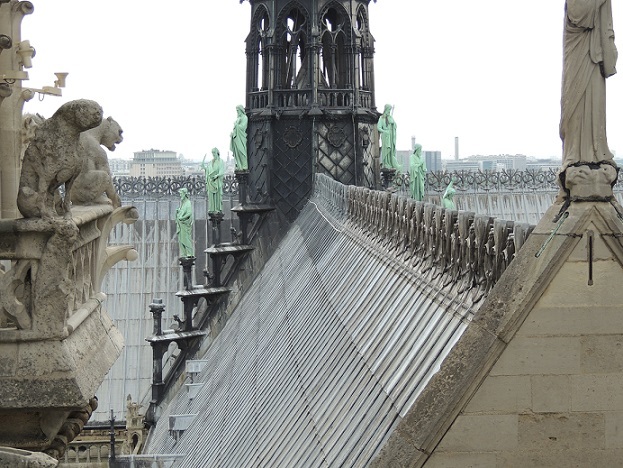 They were gargoyles that were designed to carry water away from the roof and sides of the church to minimize damage from a rainstorm. Architect Eugene Violet-le-Duc playfully added his own image for one of the gargoyles. But their fearsome looks – especially the chimeras – were “especially useful in sending a strong message to the common people, most of whom were illiterate,” according to Wikipedia. Gargoyles have been viewed alternately as a concept of evil or as elements that scared evil spirits away from the church. Much of the church’s religious imagery was destroyed in the 1790s during the French Revolution. In 1845, Architect Eugene Violet-le-Duc began extensive restoration to the cathedral, returning it to its original Gothic state. It took 25 years to complete. * Architect Eugene Violet-le-Duc playfully added his own image for one of the gargoyles. Next article How Do I Count the Ways? Well those were some facts about gargoyles didn’t know. Thank you for sharing, Judy. Thank you for your comments, Deb. 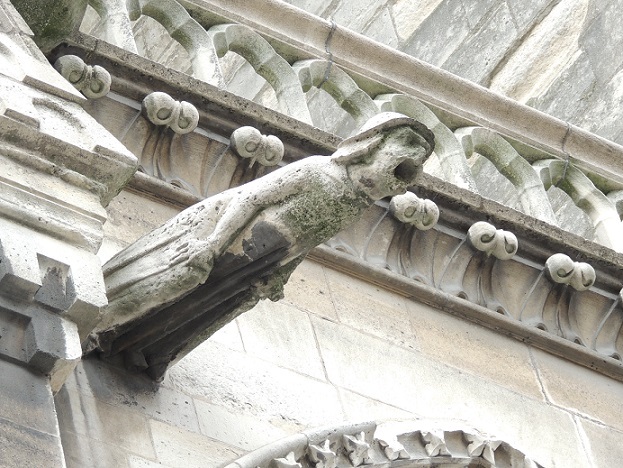 I learned about the gargoyles being used for drainage after I started teaching. I just discovered the origin of ‘le Stryge’s name’ after I began research for this post. Fascinating, hideous creatures. Glad you love them and enjoyed my post. Thank you, refined. Stunning photos, Judy! And memories.. I remember very clearly climbing those towers for the first time as a child, seeing the statues lined up on the roof, all looking out over Paris.. except the one, of course. Let me tell you, Sue, I was pretty winded as I climbed those stairs in June. But the view of the statues and the city was worth it. *chuckles* I remember.. it wasn’t the easier climb even way back… but it is a perspective you just don’t get any other way. Stunning photos and thank you, Judy for sharing this. 🙂 I didn’ t see them from up close when I visited the place. 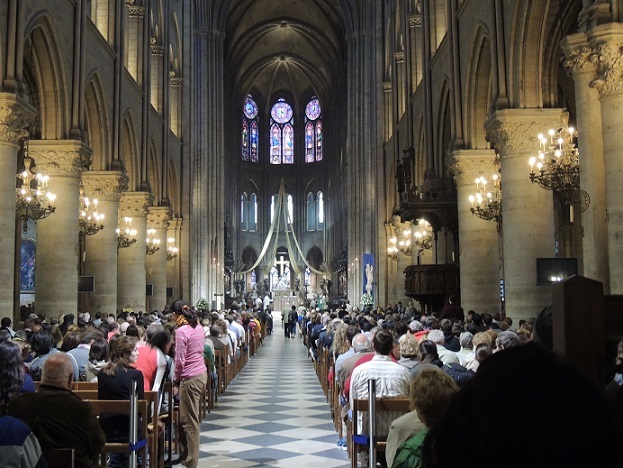 Your photos of Notre Dame were pretty amazing, littlelilly. That climb up to the tower is a tight one up the winding staircase. Once you get to the top, that’s quickly forgotten because the view is incredible. Thank you for your comment.. I Missed seeing the chimeras. I only saw Notre Dame from afar. I wish I went closer. In a way I did through your beautiful pictures. A visual delight. Thanks. Thank you for your comments, Island Traveler. I’m glad you enjoyed the photos, and hope you had a wonderful time visiting Paris. It’s a delightful city. You’ve taken us on an up close and personal look at the chimeras, Judy. The pictures are terrific! Any closer and we could have had tea. 🙂 Glad you enjoyed the photos, Marilyn. Great photographs, Judy. Did you take all of them? 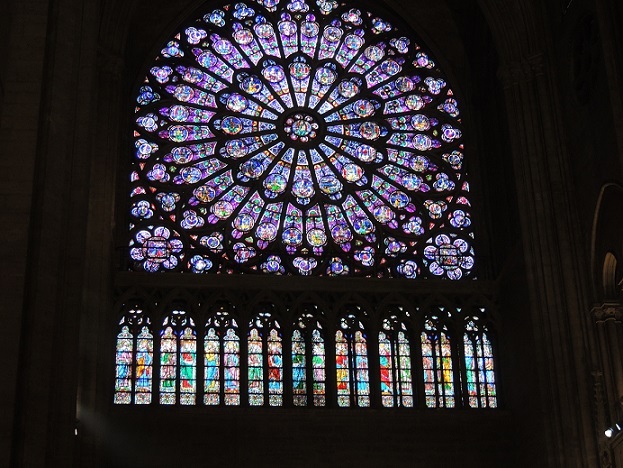 I love the rose window in the cathedral. And I’d never seen pictures of the modern Paris skyline — I didn’t even know they had skyscrapers. Glad you liked the photos, Charles. Yes, I did take all of them. That stained-glass window is one of my favorites. Despite my lack-of-skills on lighting, I was happy I got a good shot of that window in the cathedral. Paris is a wonderful mix of old and new buildings. Judy, what a treat! I have never heard the Meryon quote before, and these pictures are just delicious! Kate, I know your fascination with architecture and really appreciate your comments. I hadn’t known of that connection between artist Charles Meryon and the chimera, le Stryge, until I checked out the history of the grotesques and the church. This is a wonderful post, my dear Judy. It helps explain your recent nomination for the Sunshine Blogger Award, where the nominator described you as bringing “sunbeams to my thinking.” That is exactly what you are– a bringer of sunbeams. You have no idea how much you brighten my day with your thoughtful comments. Thank you. Suzy, you are a rebel. 🙂 For many though, I’m sure those gargoyles provided all the convincing the faithful needed to confess NOW and shape up. The gargoyles do have an exceptional view. 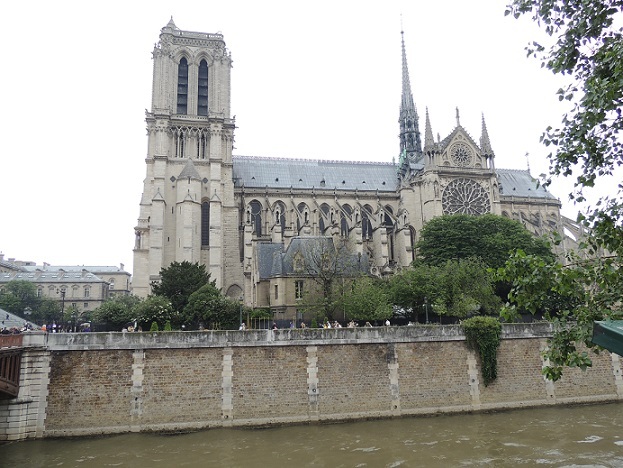 I was on level with some of them and Paris is beautiful – whether it’s seen from the balcony of the Notre Dame or elsewhere. If they only designed one that kept mosquitoes away, I’d have one!